Posted on February 16, 2008	by Linda S.
I got out both my Bossie Midi and my Prelude and decided to give the Icelandic a tr y. It’s definitely different from the others, but I’m finding I can spin smaller singles. 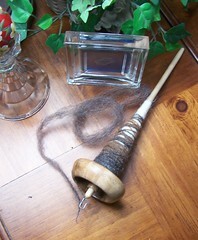 There are three different colors to the Icelandic on the spindle.. 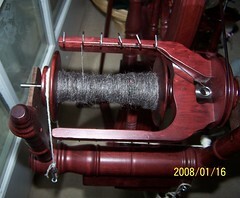 The deep gray/black is what I am spinning on my Prelude.. The browns are still waiting to be washed and carded.. The grey/black is working up wonderfully on the Prelude. The single is much easier to work into a smaller thread. I have no idea what will be made with this thread. It seems to have an itchiness that makes me wonder about anything touching the skin. Perhaps a cardigan or vest that will be worn over something else. This entry was posted in Handcraft, Handwork, Spindling, Spinning. Bookmark the permalink.